Relying on Email: A $100K Mistake? Back before I joined the team at Redbooth, I once spent an entire Monday cleaning out my email inbox – and I only got halfway through it. I’m sure almost everyone has been in this situation before. Beyond the amount of time it took, what was most shocking is that I had 7 or 8 people I found that I forgot to follow up with that month! (I’m in sales, so forgetting to follow up with someone is a big deal – or potentially a lost deal, I should say.) This happens on all sales teams. Actually, it happens on all teams, regardless of function or department. I realized that EVERY single communication we had — whether it was around a new press release, sales operations memos, new marketing collateral, company events, industry articles, best practices, or human resources administration — was sent through email. This led to my most important emails that I truly needed to respond to falling off my radar — or never making it onto my radar in the first place. I recently came across Kelly Decker and Ben Decker’s Harvard Business Review article “What Email, IM, and the Phone Are Each Good For,” and it got me thinking. The authors highlight how most professionals are drowning in emails. 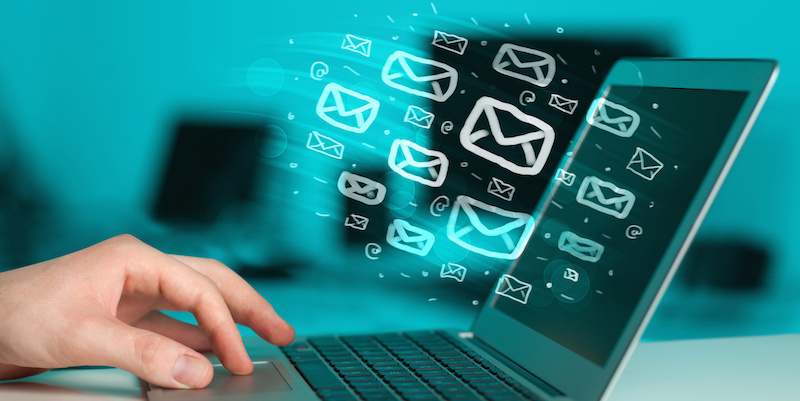 People are sending out plenty, too — the average person sends and receives 122 emails per day. In the article, the authors take a hard look at when it is okay to use email, the phone, or IM chat to talk to colleagues. This made me pause and wonder: what if what happened to me was happening across the entire team? What if the end result just isn’t communication frustration, but a larger business impact? Let’s do the math. Multiply 7-8 contacts missed by a sales team of 20+ people, and that ends up being 150+ potential clients that weren’t followed up with. Depending on the specifics, that could be up to $100,000 in revenue lost for the month. Wow. With a team of that size, it could mean 1 MILLION dollars per year – lost. WOW. That could make the difference between an organization hitting monthly targets or not. Email just got a lot more expensive. If you’re on a sales team, you can probably relate — and these communication challenges can just as easily affect a marketing team, an IT team, an Operations team, Procurement, Executive Leadership, and more. What might your team be losing out on? My colleagues and I field questions here at Redbooth every day from folks at companies of every shape and size who want to find a sustainable solution to their communication challenges. In that spirit, and inspired by the Deckers’ article, are some of the pluses, minuses, and tips for using the different communications methods that most of us have access to sitting at work. Challenges: “Reply All” and “CC/BCC” are some of the most abused functions on email that contribute to overflowing inboxes. Because people are used to email, it can be easy to slip into it as the default tool for conversations, which can quickly get near-impossible to manage. Tip: It may make sense to send an email when the information you have to convey is specific and takes your teammate only 1-2 minutes to read, think about, and delete. Remember, email is great for the individual, but gets tricky when used for communication and collaboration across a team or teams. Pros: Very easy and quick. Makes it simple for you to get information that is urgent and specific in seconds. Challenges: Especially with standalone tools, direct messaging can be seen and used as a standalone “friend chat” that ends up being more social than work-focused. Make sure it is integrated into your business workflows. Tip: As the Deckers put it, “Think of IM as a great place to get an immediate answer to keep the ball moving.” Make sure it is something that is urgent. If your platform doesn’t make it easy to provide context to the task or initiative you’re referencing, take a moment to add it so that your teammates can understand right away. Pros: “When you have a lot to say or are dealing with a sensitive topic, a quick chat on the phone or in person is more ideal than volleying emails back and forth,” say Decker and Decker. What the Deckers are saying is: let’s get stuff done now and move forward on the phone (or, as we often do at Redbooth, on a video call). Challenges: Meetings are traditionally the largest time drain in corporate America, where up to half of all meetings are considered a waste of time (31 hours per month per person). If you’re not strategic about how you run phone meetings, they can easily become a similar statistic. Tip: Plan out the phone meeting with the necessary context you need so it is concise and focused. Have the right tools handy so you can make a decision and capture actions items and next steps for your and your team. Think about video meetings, too. 80% of communication is body language. People also multi-task less in a video meeting, which increases focus and engagement — just make sure there is a clear agenda and that it is relevant to everyone! Pros: When team chat is provided around a specific business context, and can be directly turned into actionable items for teams, it addresses many of the challenges teams have today, including email overload, prioritizing communications based on context, and increasing team and individual accountability. Challenges: There is a significant difference between chat for teams and team business chat. If you’re simply using a chat product available to teams, then you haven’t solved the collaboration challenges. Most team chat tools don’t allow you to capture, delegate, and execute on action items. Without those capabilities, you’ve only shifted communication from email to another setting, and you’ll soon end up with yet another channel that is overloaded. Tips: Don’t just choose a chat platform — look for an enterprise messaging platform that directly integrates team business discussion within the important workflow stages: brainstorming, planning, adapting, executing, and process reflection. Make sure this platform also allows you to easily recover certain threads and communications. Otherwise you are left with the overloaded channel mentioned above. You want to be able to easily access conversations and team ideas quickly to revisit key decision processes. Realize that effective communication isn’t just about saving an hour here and there. It’s about making sure our teams and organization are successful (AND that we all don’t go insane with shoulder taps, losing focus, and fight a losing battle with email). Today, based on the questions our sales team hears, enterprise teams are realizing that a single web video conferencing tool, simple task management tool, file sharing solution, or chat tool does NOT fix the collaboration problem — merely one aspect of it. I think we’ve all worked at companies that use several of these tools. So why do these collaboration problems still exist? Based on what I’ve seen, it’s because none of them are linked together. You have to leave one work tool to go to another, then another, then another. Who wants to do that? Eventually you end up ditching the array of new tools and reverting back to email overload because the root problem isn’t solved. Real team collaboration is a mixture of many things: versatile communication, accountability, visibility, reflection, agility, and alignment. They must all be tightly integrated, and that’s when team workflows can really be smooth, agile, and effective. It’s not about a single missed email, one overdue action item, a-back and-forth interaction that takes up more time than it should, or a one-hour meeting that isn’t as productive as it could be. It’s about the collective effect of all these inefficiencies and collaboration frustrations — and the missed opportunities, like the one I had where an overcrowded email box led to 7-8 missed follow ups with potential prospects. What might the business impact be for your team? Whatever communication tools you’re using today, take the time to step back and think carefully about whether they’re meeting your needs…or costing you opportunities. It can really make a difference to your bottom line.